The Horizon i-DS2 takes a minimalist approach to the iPod speaker set, but this doesn't mean it lacks features. 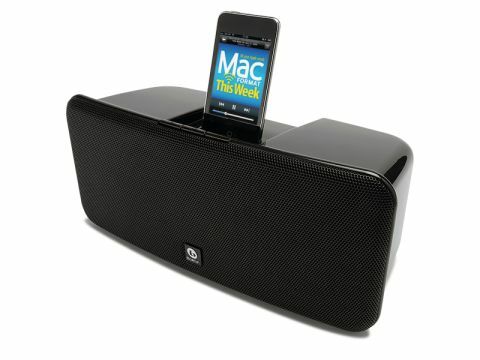 It boasts a USB port so you can connect to your Mac and manage your iPod's music while it's docked, a Video Out port for viewing photos or videos on your TV, and Aux In for connecting any audio device with a 3.5mm socket. Power and volume buttons are positioned on both the device and the hand controller, which also adds mute, pause and track skip functions. As you'd expect from an iPod speaker dock, the i-DS2 powers any device that charges through a USB cable. FireWire-charged iPods can be docked but not powered or charged, and iPhones must be put in Airplane Mode. It also lacks a headphone socket for private listening. The i-DS2's straight-down-the-line approach limits your hands-on control over the sound but, thankfully, audio quality is great out of the box. It's ideal for those who like lots of bass, though is slightly less capable in the treble department. Unfortunately it's a little overpriced, especially compared to Boston's own Duo-i, which can be bought for under £130 and includes an AM/FM clock radio and manual bass and treble adjustment. Sonically, the Horizon i-DS2 isn't quite up to the standards set by the Yamaha PDX-30, but it offers a much better range of connectivity options. It's ideal for setting up next to your Mac or television, and it's stylish enough not to embarrass either.